Horace Mann is an elementary school in Washington, DC, serving the children of Northwest DC for over seventy years. The school is conveniently located across the street from the American University campus. For over five years, AU's School of Education has had a partnership with Horace Mann, along with other DC elementary schools, where the schools will hire elementary and early childhood education graduate students to serve as partner teachers in a classroom. The partner teacher is a paid position that assists the lead teacher in the classroom. Partner teachers complete their practicum and student teaching semesters in their school classroom. Horace Mann's current principal, Liz Whisnant, has served as the school's principal for 10 years. In 2011, Principal Whisnant was recognized with a Rubenstein Award for Excellence in Leadership and the Washington Post Distinguished Educational Leadership Award. We recently sat down with Principal Whisnant and asked her about Horace Mann's collaboration with the AU's School of Education. 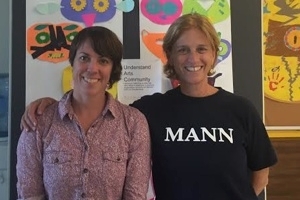 How has the program at AU enhanced your partner teacher program at Mann? We are a smarter school because we have introduced AU student teachers into our world. They come with both need-to-know questions because they are practitioners, and they also come with want-to know questions because they're developing their pedagogy. The questions that they ask and the wonderings of 'Why do you do that?' and 'Tell me more about this!,' makes the teachers and the school articulate the rationale behind our practice. Our work as a group of educators crystalizes when we introduce these student teachers into our life. How are partner teachers from AU equipped to assist with instruction in the classroom? The first thing is modeling. The partner teachers are in the company of talented, thoughtful, intentional educators, and are required to do a lot of observing and noting and then mimicking. It's similar to the gradual release model where they are watching and trying a strategy while receiving feedback. We do not hesitate to allow partner teachers to work with the children almost immediately. We give them domain over a small part of the curriculum from the very beginning. Most of them either have some role in science education or in social studies education so that they have something that is really their own. We also do a lot of pairings. For example, the partner teachers in 3rd grade who are working on social studies are working together. They receive a lot of practice working in a collaborative setting. I also do professional development with the partner teachers. We gather once a month to have guided discussions about aspect of teaching I feel are important and to explore issues brought up by the partner teachers. I also use these meetings to have the partner teachers learn from other experts in the building. Recently the literacy consultants gave the partner teachers instruction on what it means to confer and do running records. We are providing them with direct instruction and building their essential teaching skills. Why do you like to hire AU graduates? I love to hire AU grads. I am able to see them in our community as learners, which really helps because I try only to hire individuals who are in that learning stance. I think that in my experience the teachers that have come to me from AU understand that they at the beginning of what is a long trajectory of learning. They are ready to put in the work to take the journey. How does the partner teacher program help you with recruitment? Can you provide an example or a story? I automatically have a pool of individuals who have already made the decision that they want to be licensed, certified teachers. They tend to talk about their experience here with their classmates. I end up getting more AU students because their peers from their classes will ask them about where they are getting great practical experience, and the student replies, "At Mann". Then the next year I might have those folks apply for a job. I also feel really pleased that one of the things I am doing is preparing teachers for other school campuses . I like that other principals call me up and have interviewed someone who is from AU and been at Mann as a partner teacher. I'm able to confidently say that they have had this nice marriage of really good practical experience and a strong pedagogical program at AU, and I am able to recommend them. Currently there are seven AU graduates who are teachers and five current AU students doing the MAT program who are currently partner teachers. Even though some of those AU alum who are teachers did not do the partner teacher program, just knowing that they are an AU grad made them a great candidate.